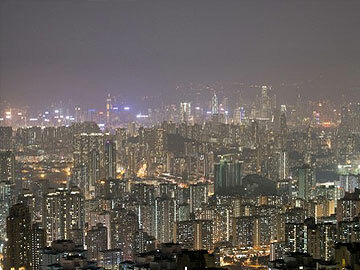 This long exposure picture shows apartment buildings and office blocks clustered tightly together in Hong Kong's Kowloon district, with the famous skyline of Hong Kong island in the background. Hong Kong: Municipal governments all over the world, particularly in developing countries with rapidly growing fleets of cars and choking air pollution, have been rushing over the past few years to force taxis and buses to switch to burning liquefied petroleum gas and compressed natural gas, frequently offering subsidies for those who do. But an early leader of the trend, Hong Kong, said Friday that the city's shift over the past decade to almost complete dependence on liquefied petroleum gas, or LPG, for light commercial vehicles had produced unintended consequences. Concentrations of nitrogen dioxide, one of the most important contributors to smog, surged by a fifth in Hong Kong's air from 2008 to 2012, and a team of local and international scientists have traced the cause to LPG-fueled vehicles, Hong Kong environmental regulators said at a news conference. The problem lies in the taxis' and minibuses' catalytic converters, said Christine Loh, the undersecretary for the environment. Unless replaced every 18 months for cars and light buses that are driven nearly around the clock, the catalytic converters become fouled, and the vehicles begin emitting extremely high levels of pollution. "The LPG vehicles, which are supposed to be cleaner, are spewing out very high levels of nitrogen," she said. Although relatively few natural-gas-powered vehicles have been deployed on a large scale in Hong Kong, they would pose the same problems, she added. As a result, the Hong Kong government will pay for the replacement of catalytic converters on the city's entire privately owned fleet of roughly 18,000 taxis and several thousand minibuses, Loh said. Pang Sik-wing, the city's principal environmental protection officer for air sciences, said the replacement effort would cost about $1,290 per vehicle. After the first free replacement, taxi and minibus owners will be responsible for replacing catalytic converters every year and a half at their own expense. Hong Kong will deploy five mobile sensor systems next year to measure the pollution from passing vehicles and send automatic notices to the registered owners of any vehicle exceeding emissions standards, requiring them to take in their vehicles for repairs or risk losing their vehicle licenses. "We will strictly enforce the emissions standard," Pang said at the news conference. Large areas of northeastern China struggled a week ago with smog so thick that schools closed and motorists had to slow down to drive through the murky air. While that smog has been linked overwhelmingly to coal consumption, vehicles have also played a role, particularly diesel-burning heavy trucks. Air pollution tends to be less severe in Hong Kong than in northern Chinese cities, but it is still much worse than in the United States or the EU. Much of the pollution in Hong Kong is generated by factories just across the border in mainland China. Referring to air quality standards set by the World Health Organization in Geneva, Loh said, "Hong Kong could shut off tomorrow: We would still not meet WHO standards because there are emissions from our neighbourhood."